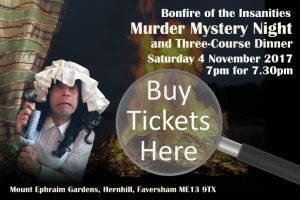 Buy your tickets for our Bonfire of the Insanities Murder Mystery and Three-Course Dinner here. The link will take you to our partner site (Khushi Hands) where you will be able to order and pay for your tickets. Tickets cost £38 plus 0.75p credit card charge. If you live locally to Faversham and can pay for and pick up your own tickets before the event, then click here. This will save you the transaction fee.